I’m gentle as a flower, there’s so much love in me but there is no man who will be happy to take it. By education I am a choreographer, at the moment I am teaching dance and fitness in the sport center. I think that I still have one because that in my life come across a man who looked only at me – my body and beauty .. but I hope that this site will let you know my character more than my body 😉 I will be happy to talk with you in chat and answer your all questions. Will you ride on horseback together with Yulianna? Comments Off on Will you ride on horseback together with Yulianna? I am beautiful women a kind and sincere and appreciate these qualities in others. I enjoy the company of my family and friends, My close people say that I am very patient, kind and feminine. I love people and communicating with them. I always try to make wise decisions in life. I am a family-oriented, faithful and devoted. I am an active person. I love travelling so much! I’m always open to new ideas and new interests. I also adore belly-dance. I will be rooting for your favorite football team next to you making your neighbors go crazy!!!! I am a big dreamer and at the same time the most accurate realist. » Read more..
Hello, friend call me no ordinary girl, because I bring some beauty into this world. I am young designer and I plet hats. I wish to find a man to share happiness and love with me and to enjoy this wonderful life! If you want enjoy love and family happiness with true and loyal woman, you are my man. So please write me. » Read more..
Wanna some photos from this beauty? Hi, I know there are a lot of pretty girls. But I am Girl of Your Dream. Just to know me better and you surely I am honest. I promise always to be honest with you. I hope find true man and create family soon. I am fond of photo and that’s why I’ve become a photographer. » Read more.. Comments Off on Wanna some photos from this beauty? Do you love creative ladies? Enjoy Tatyana’s talent. Hello, I’m an all-around, active girl) I like and always try to make my every day worth and bright. I like to bring joy and to make people smiling! 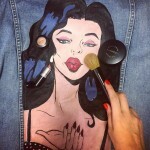 My hobby is to draw on the jeans jackets. I am not a star or sun, but maybe I will be shining one day personally for you)))) How do you like such idea?)))) I want create family and make all my close people happy. Comments Off on Do you love creative ladies? Enjoy Tatyana’s talent. What can i tell about myself? I try to make it very simple… well, I grew up in a poor family in the village. I have a big family and it was hard because I was the eldest, I helped with everything. I went to school for sports, I was so sportive girl after school I went to kiev and go to university. I start work in the modeling industry but now I work in bank. I understand that the quiet work I prefer more. I have a beautiful daughter, work and life! all what I need now – is a man. » Read more..
Hello, I can be different!I am wild and passionate! I am a singer. I am gentle and tender!! But I am real!Sometimes you will wake up with a gentle kitten sleeping next to you but sometimes the wild tigress will burn the flame of passion in your heart. But only real man can feel who I really am…And I hope to find him at this site pretty soon. Don’t miss your chance to fall in love with me ;))) » Read more..
What do you see in Irina’s paintings? Hi! I am Irina and I write pictures and poems! Speaking about my character I am cheerful, resourceful, sometimes serious. I am active and don’t like monotony. I’m hot tempered. Very kind and sympathetic. Not rancorous. Open for communication and new feelings. On the website I’m looking for a man who will be caring and loving, generous, held as a person. Appearance isn’t important for me. The main thing for me is what my man has in his heart. Namely in the heart and soul must be harmony and warmth. Comments Off on What do you see in Irina’s paintings? Enjoy the dance of amazing beauty Tatyana! Do you like poledance? My name is Tatyana and it is my hobby! Comments Off on Enjoy the dance of amazing beauty Tatyana!